Garry Monk backed Hadi Sacko’s attitude and unpredictable style to make him a big hit at Leeds United after revealing the winger ran through a severe bout of cramp during Tuesday’s precious win over Blackburn Rovers. Sacko overcame fitness problems in the second half to turn a key league game in United’s favour with an unplayable display at Elland Road. The Frenchman’s running on the right wing wore down a Blackburn side who are bottom of the Championship table and chose to defend in numbers, and his cross delivered the opening goal for Chris Wood. 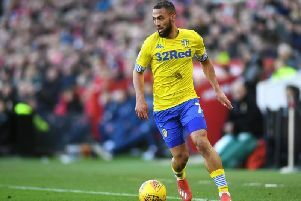 Marvin Emnes and Kyle Bartley then exchanged late finishes as Leeds dug out a 2-1 victory and Sacko missed a glaring chance to wrap up the win in injury-time after another break from deep left Rovers’ defence trailing. Leeds took a gamble on the 22-year-old when they signed him from Sporting Lisbon in July, bringing him to England on a season-long loan with a view to a permanent deal, but Sacko has adapted quickly to the Championship. United head coach Monk was under pressure to secure a result on Tuesday after a poor start to the season and speculation that club owner Massimo Cellino was losing patience with him, and Sacko was one of several players who delivered on an important evening. “He’s done really well since he walked through the door,” Monk said. “He’s fantastic to work with. He’s still a little bit raw in certain areas of his game and that’s for us to help and work on with him but he’s a very naturally-gifted player. You don’t want to take away too much from his game because that unpredictability can be a big weapon. It’s helped us already this season. Monk opted to leave Sacko on the pitch until the final whistle, despite the youngster suffering from cramp as the game went on. The victory gave Monk his first home win as head coach and lifted Leeds out of the division’s relegation zone. Monk said: “I need a character like Hadi. He was suffering physically but I knew with the character of the lad that he’d push through right until the end. Have you downloaded the free YEP app available on Android and iphone?